for $169,000 with 3 bedrooms and 2 full baths. 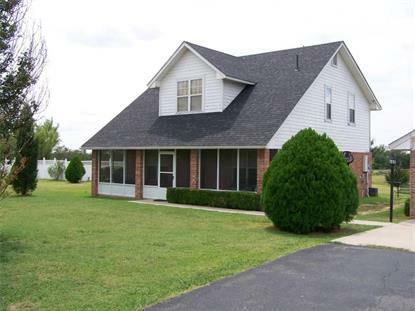 This 1,664 square foot home was built in 1999 on a lot size of 2.83 Acre(s). Back on Market! Was ready to Close when buyer was Deployed! Empty, Cleaned and Inspected. Ready for Family!Near Town, 10 min. to I-35, Appealing 3 bdrm. 2 bath, downstairs mstr. bath has walk-in tub w/hand held shower, screened front porch, upstairs has small sitting area for TV or office plus oversized closet for strg., dozens of trees in front yard, white vinyl fencing, cellar & strg. building paved circle drive, Great home for anyone wanting peace & tranquility!! AND NEW ROOF PUT ON IN JULY 2018! © 2017 [or current year] MLSOK, Inc. All rights reserved. Certain information contained herein is derived from information which is the licensed property of, and copyrighted by, MLSOK, Inc. We do not attempt to independently verify the currency, completeness, accuracy or authenticity of the data contained herein. It may be subject to transcription and transmission errors. Accordingly, the data is provided on an “as is” “as available” basis only and may not reflect all real estate activity in the market. Last updated 4/25/2019.